At one point, the Prince Albert slipper was only worn by those with a specific status and wealth. They were the preserve of those who used their dress to impress, and those with the necessary income to indulge in a few extravagances. However, nowadays, this style of shoe has been embraced by a completely new audience and the lines between target markets have become slightly blurred. The original wearer and trend setter himself, Prince Albert (a well-respected consort of Queen Elizabeth) began wearing his English slippers to black-tie events and since then, it was common for gentlemen of a specific calibre to wear these to clubs and in smoking rooms. Some members of the royal family still wear the Prince Albert slippers today. Prince William, for example, was recently seen sporting this style of shoe to the BAFTAs with his wife, the Duchess of Cambridge. On top of royalty, there’s a massive range of male celebrities who have warmed to the trend. Starting with the ideal and traditional gentlemen; Stephen Fry, Eddie Redmayne, Robert De Niro and Michael Caine have all been photographed wearing the shoe. However, a new generation have stepped forward, adopting the style and adapting it to fit in with their own; Kanye West, Scott Disick, Ryan Gosling, Kit Harrington, Spencer Matthews and Snoop Dog. With everywhere from the red carpet to the studio being an appropriate place for the Prince Albert slipper, it’s clear that the trend is vey much alive and well. 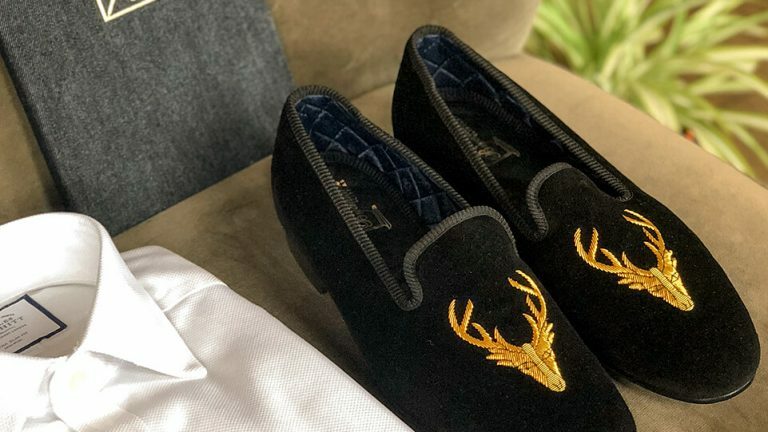 Undoubtedly a timeless piece in fashion, there is no fear that the Prince Albert slipper will ever fall out favour amongst the discerning shoe wearer.